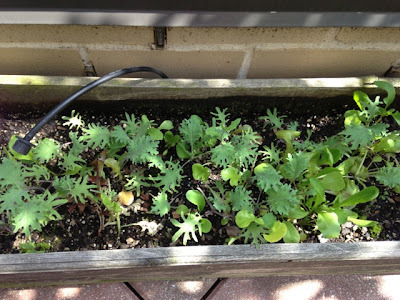 NYC Composts - and so can you! Check out this story in Crain's New York Business by Miriam Souccar (and edited by me!) about New Yorkers who compost their food waste, even when family and friends say its gross. These folks are ahead of the curve. Soon enough, the whole city will be expected to compost. I personally can't wait! Every time she so much as peels a carrot, Denise Oliveira takes the waste and stores it in a bag in her freezer instead of throwing it in the garbage. Her freezer is often so full of scraps that there is no room for actual food, but that's the only way Ms. Oliveira can compost without smelling up her small Manhattan apartment. Once a week, she lugs the bags to a composting bin at the Union Square Greenmarket. Ms. Oliveira, who learned about composting from her mother in Brazil, started doing it a year ago in observance of Lent. Her brother thinks it's gross, and her friends think she's weird. Even Ms. Oliveira admits that composting in New York City is not for the squeamish. "Sometimes you get to the green market and the bin is already piled up so high that you are placing your scraps on this overflowing mountain," said Ms. Oliveira, a freelance writer. Between knee surgery this winter and the rainy spring our gardening season has gotten off to a slow start. 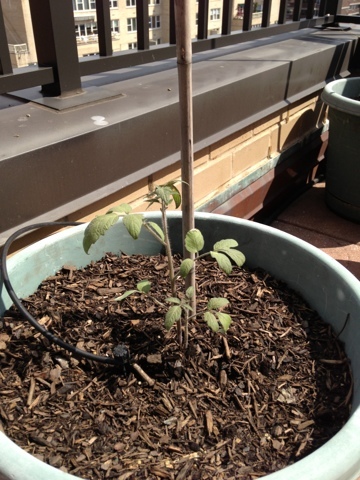 We were late to plant our tomato seedlings and did not get them into their pots till mid-June. And now they are taking their sweet time growing. They're still tiny, and have yet to flower. By July they should be twice as big. We're having better luck with lettuce which likes chilly wet weather. Our tomato plants are so puny. 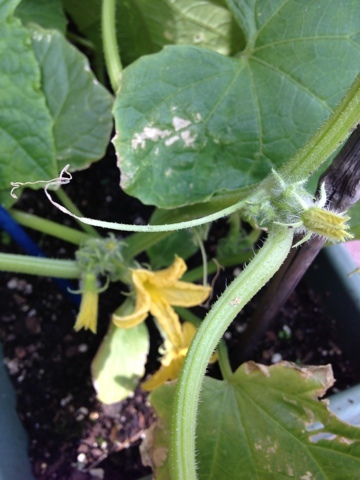 I've already harvested two cucumbers. I hope this flowering plant bears more fruit! Our flowers are doing the best of all. The hydrangea is the biggest and fullest its ever been. I love the pink blooms. But veggies are the main event for us. I hope the season isn't a total wash out! An apartment with a generous terrace turned two city dwellers into urban gardeners. 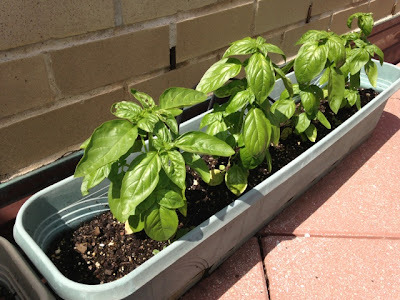 Since we got to our 25th Street apartment in 2005, our terrace has been exceptionally fruitful, yielding luscious crops of tomatoes, peppers, japanese eggplants, fresh basil and more, all grown in pots. Hope you enjoy visiting the site! Lead in the soil? 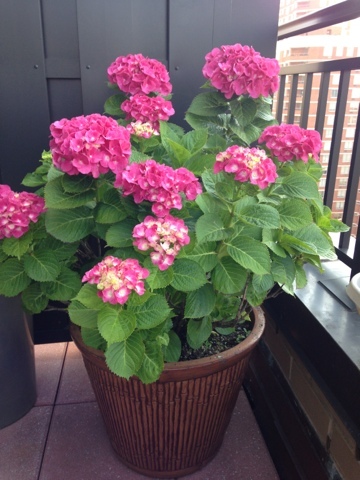 Is your urban garden at risk? Union Square Green Market is the place we head each spring for our starter flowers, eggplants and herbs. Sometimes they come with little bugs and pests, so we have to chose carefully! This recipe is so easy, and you can use peppers from the garden or store bought...My Aunt Joan loves them with mozzarella. Wash and core peppers and cut into wide strips, about two and a half inches thick. Flatten the strips and lay them on a baking sheet that has been covered in tin foil. Coarsley chop the garlic and set aside. Turn on the broiler and put the peppers underneath the flame, until the tops blacken (about 10 minutes or less depending on how close they are to the flame.) Don't worry if they look burned, that's the point. Once the skin is black, remove the sheet from the oven. Spread the chopped garlic on top of the peppers and wrap the whole shebang in the foil on the baking sheet. Allow to sit about half an hour until the peppers are cool enough to handle. Peel off the blackened skin and discard. Put the roasted peppers and garlic, which has been steamed by the hot peppers, into a container, add olive oil, and voila - roasted peppers, just like a restaurant. Enjoy! I love this recipe. It's easy to follow and the soup tastes great! Directions: Combine all ingredients. Blend slightly, to desired consistency. Place in non-metal, non-reactive storage container, cover tightly and refrigerate overnight, allowing flavors to blend. My aunt loves to pile this sauce on fish, chicken or a piece of fresh Italian bread. Put tomatoes in a bowl and pop in the microwave for 3 to 4 minutes, or until the skin is just cracking. Let cool. Peel the skin off the tomatoes over the bowl, catching the juice and the pulp. Discard the skin. Add olive oil to saute pan over low heat. Saute garlic until tender (one or two minutes.) Add the peeled tomatoes. Stir and mash the pulp. Add salt, pepper and basil. Cook until the sauce thickens a bit. Enjoy immediately or freeze. Coarse sea salt or kosher salt and freshly ground black pepper.